The Battelle-Tompkins Building, pictured above houses American University’s College of Arts and Sciences, and is AU’s first ENERGY STAR certified building. 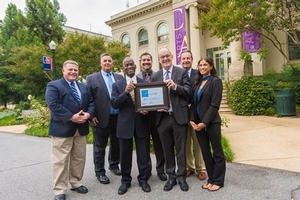 The Environmental Protection Agency (EPA) awarded American University recently with its first ENERGY STAR certification for the Battelle Tompkins building. The EPA’s ENERGY STAR certification recognizes buildings that have reduced greenhouse gas emissions through commitments to use more energy-efficient products and implement energy savings practices. Battelle-Tompkins received an ENERGY STAR score of 84, ranking it in the top 25 percent of similar facilities nationwide in its energy practice and efficiency. Commercial buildings that earn EPA’s ENERGY STAR certification use an average of 35 percent less energy than typical buildings and release 35 percent less carbon dioxide into the atmosphere. According to the EPA, 75 percent of greenhouse gases in Washington, DC come from buildings. AU improved its energy performance in Batelle-Tompkins by managing its energy-related practices and reporting the collected data in the Portfolio Manager tool provided by the EPA. Portfolio Manager benchmarks each building on campus and tracks usage and energy-related costs. AU also purchased ENERGY STAR or energy-efficient products. Additionally, the Facilities Management Department addressed energy usage by educating and engaging staff and students on methods of curtailment and other energy-saving initiatives, and by improving maintenance practices. Washington, DC currently leads the nation with 480 ENERGY STAR-certified buildings. The buildings include offices, banks, hospitals, schools, resident halls, and more. ENERGY STAR products and facilities have proven to be more energy efficient, lower the cost for facilities, and help to protect the environment by lowering the amount of greenhouse gases being emitted every year. According to the EPA, during the past 20 years, homes and businesses have saved more than $200 billion on utility bills. Additionally, more than 1.5 billion metric tons of greenhouse gas emissions have been prevented. The Energy and Engineering team is committed to the university’s goals of becoming carbon neutral by 2020, reducing greenhouse gases emissions, and continuing to identify opportunities to achieve certifications such as ENERGY STAR. For more information about how you can get involved with saving energy, contact the Energy Team at energyteam@american.edu or through the website at american.edu/energy.